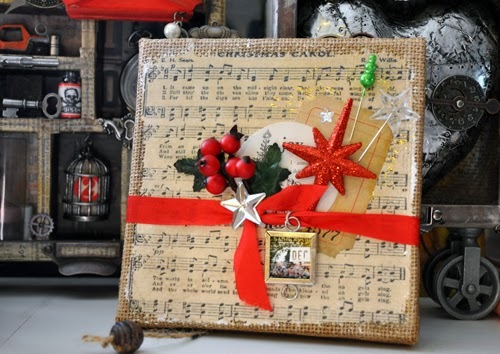 Thanksgiving is over, the leftovers are in the fridge and it's time to start thinking about Christmas, so I am here today to show you how to make a beautiful Christmas canvas. If you're like me you'd rather avoid the Black Friday madness and stay home and craft. 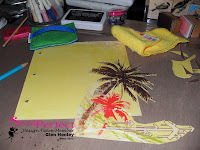 Here's a quick project I put together using the Best Glue Ever, ScraPerfect Designer Transfer Foil, a stencil, a canvas, and Embellie Gellie (and a bit of the Best Cleaner Ever, too!). I started with this Tim Holtz District Market canvas. 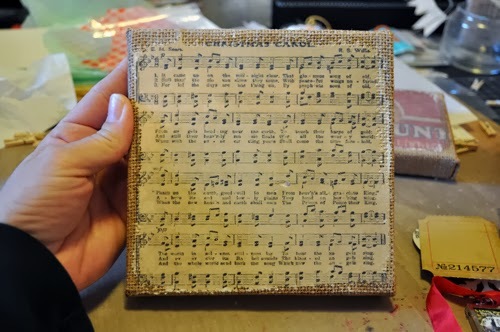 It has a burlap background with distressed music paper already on it. 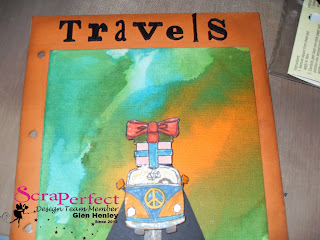 You can easily put something similar together using a plain canvas. 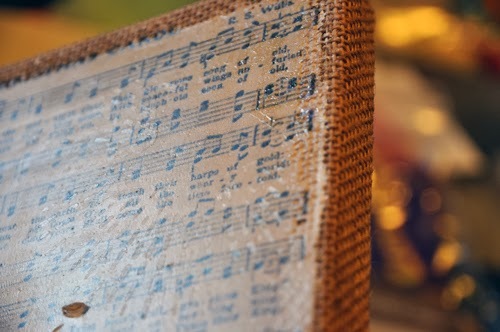 First stretch burlap or fabric over the canvas and staple around the edges using a staple gun. Next adhere paper to the fabric by squeezing some of the Best Glue Ever on to the back of the paper and spreading it with a foam brush to cover the entire surface. 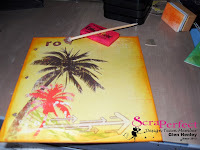 My first step was to use a stencil with the Best Glue Ever. I placed the stencil over the canvas, squeezed a bit of the Best Glue Ever onto my craft sheet, and then applied to the stencil using a foam brush. 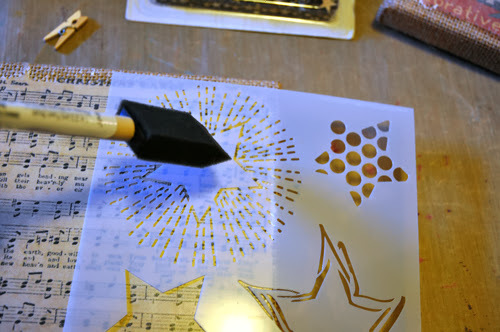 You could also use an old credit card and scrape the glue through the stencil or use your fingers to dab into the stencil. Each way will give you a slightly different result. When I was finished, the first thing I did was clean my stencil. 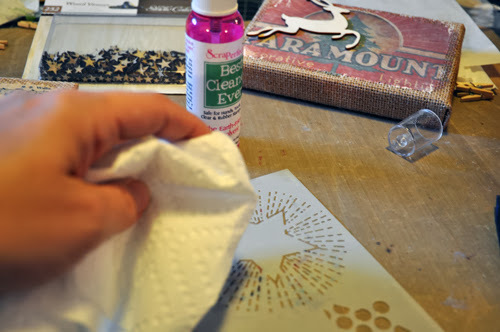 Since the Best Glue Ever dries tacky, you want to clean off your stencil right away - or else you might glue your stencil to your next project! Spritz a bit of the Best Cleaner Ever onto the stencil and wipe with a paper towel or a Perfect Cleaning Cloth. 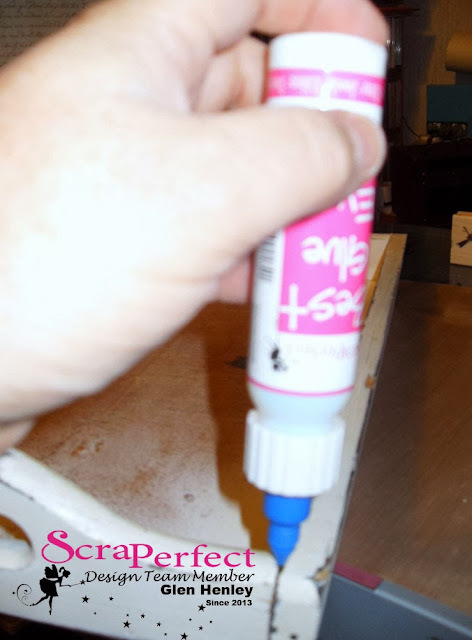 I used the same towel to clean off the glue from my craft mat. I then rinsed the stencil in water to remove the rest of the cleaner. I didn't need to worry about my canvas, since the glue dries tacky. 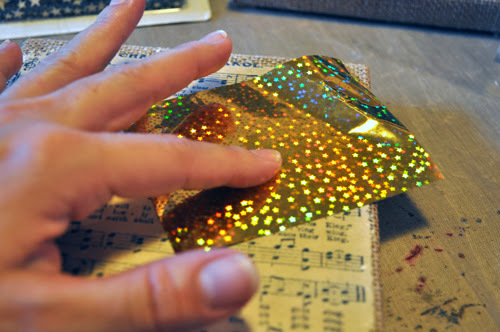 That's what makes it perfect for foiling. Can you see the glue? Next, on to foiling! 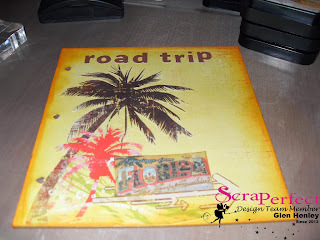 I took a piece of ScraPerfect foil, placed it design side up and rubbed lightly. And now to add on the embellishments. 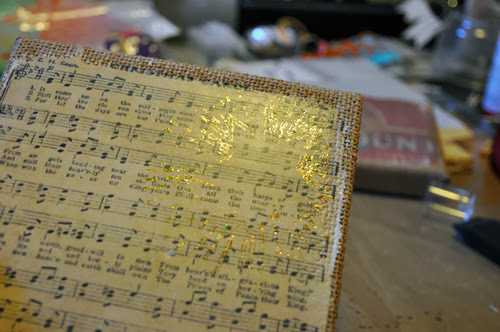 After adhering a few paper embellishments with the Best Glue Ever, I wrapped a ribbon around the canvas. To help hold it in place I added a line of the Best Glue Ever across the middle and waited for it to dry tacky. 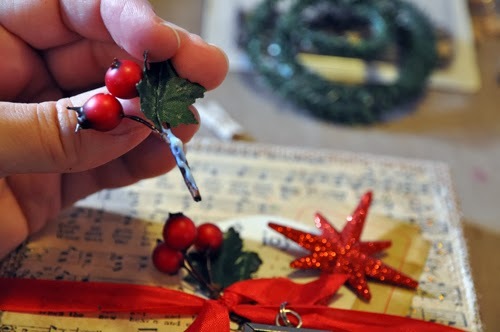 Once it was tacky, I pressed my ribbon into the glue and tied it. When you use the Best Glue Ever this way, your ribbon will never get discolored or have the glue seep through. It truly is an invisible hold. To add the rest of the embellishments, I applied the Best Glue Ever and held in place for about 30 seconds to set them. I even applied glue to the back of my hanging charm. 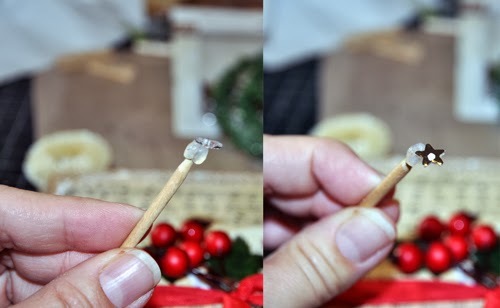 For the small star I used Embellie Gellie to pick it up and hold it while I applied a tiny drop of the Best Glue Ever. I was then able to set it down easily onto my project. The two pins were just stuck into the canvas directly. Hello Fellow Artists it's Glen here to show you how to make a French Chateau serving tray. 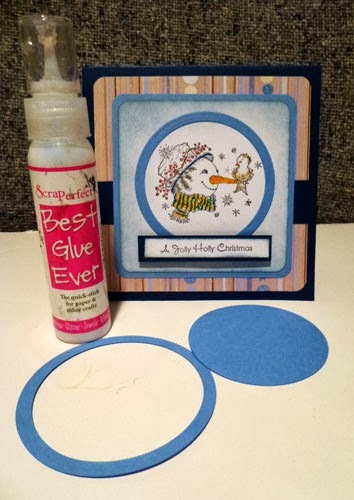 It starts with some great ways to use the Best Glue Ever and make crackin good projects with found objects and garage sale finds. I found a wooden serving tray at a thrift store and decided to use it as a base for some altering. 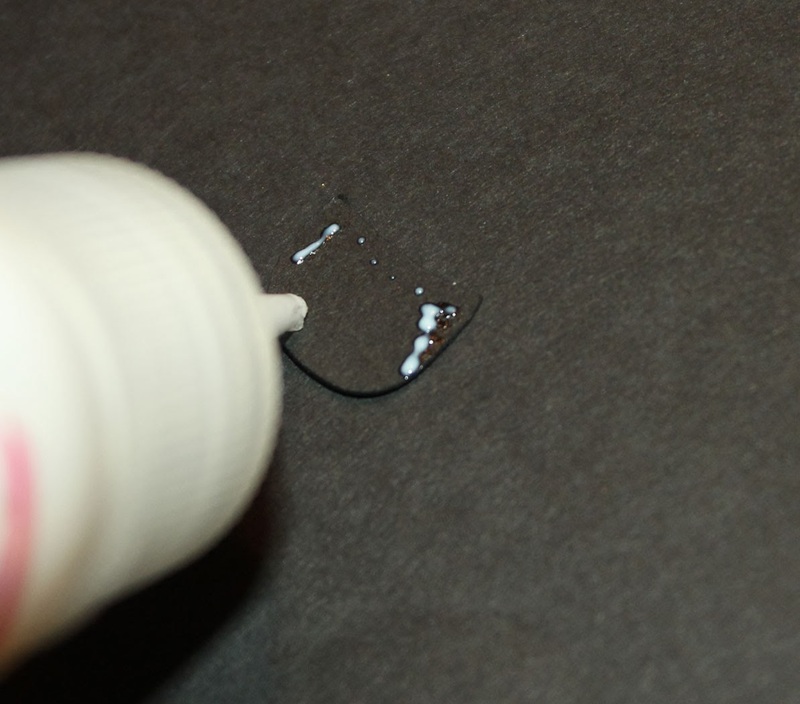 I start by using the Best Glue Ever to make a joint repair, you can see clearly how the No-Clog Writing Cap makes getting into a tight place easy. and wipe down the entire piece, it's amazing how well these products work together. 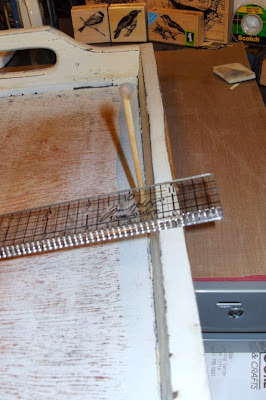 Then I take out my ruler and start measuring for the papers I've decided to use for the project, I have to allow for the angled opening and decide to use my Embellie Gellie stick to drop a line as it were to get a measurement. Here then is the project about half done, I still have to add papers inside and out edges and something for the base to make it cushioned and finished. 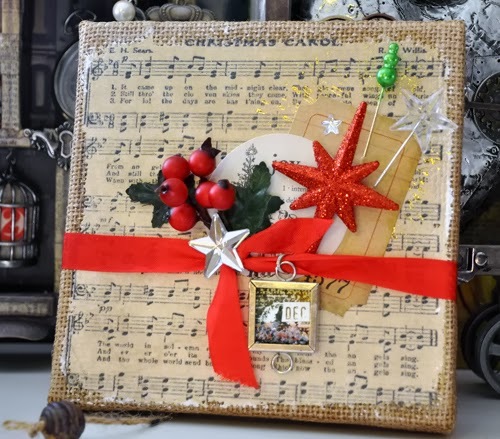 The products I used are all available from the ScraPerfect.com website and would make an excellent gift for the crafters in your life. Till next time check out the other projects made by the design team members and see you soon. 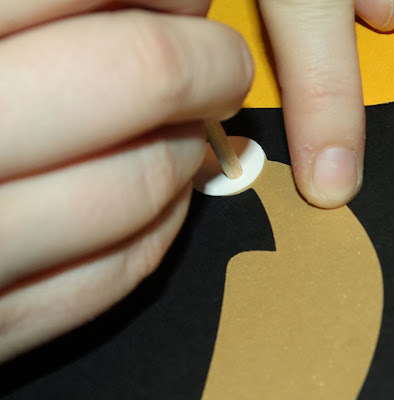 Michelle here to show you how to unstick a sticker backing. I use the Perfect Crafting Pouch to make a sticker not sticky. 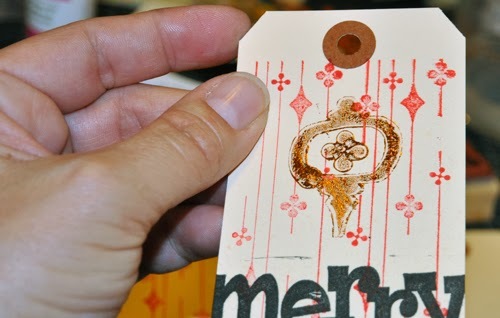 Stickers are great for embellishing projects but sometimes you don't want it to be sticky. I love to add dimension to my projects but worry about the popped up sticker gathering things that are unwanted. 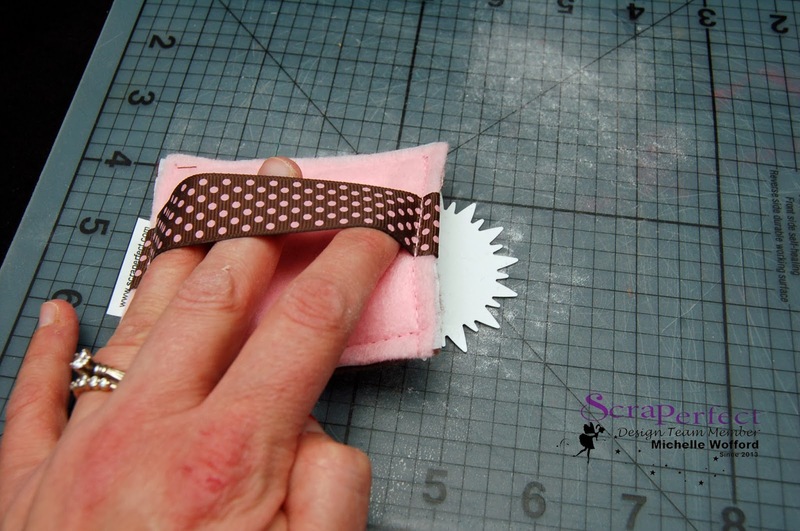 The Perfect Crafting Pouch is an easy solution to take the stickiness of the sticker away. Not only is the pouch effective it's cute too! 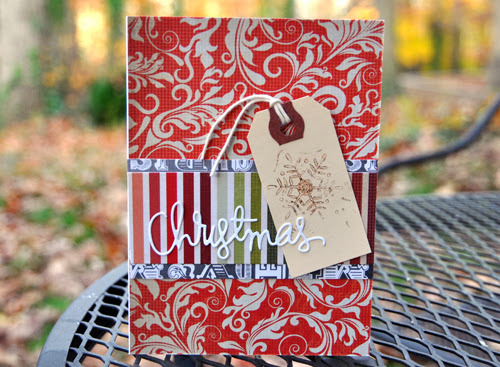 Slip your hand under the ribbon and simply dab and the sticker until it's no longer sticky. Now use Embellie Gellie to grab you newly unstuck sticker, add some pop up adhesive and add you 3D element to your project. 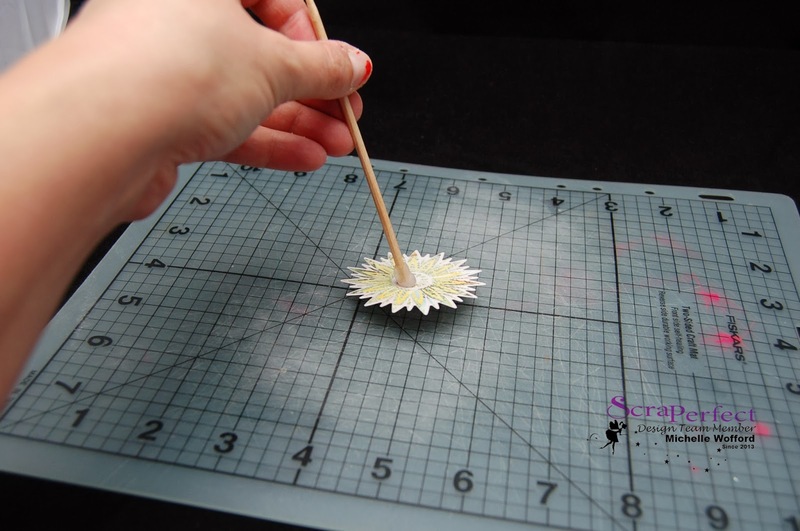 Tip: The Best Glue Ever is great for making custom size glue spots including 3 dimensional glue spots. 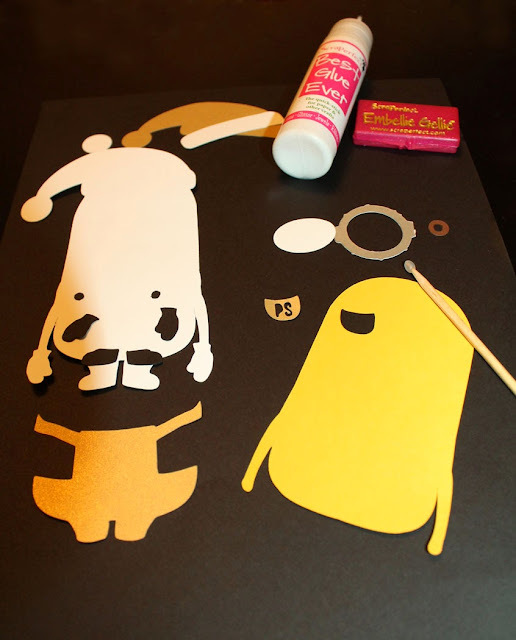 Good Morning, Chelsea here this morning showing you how to make a Minnion's paper piecing.. 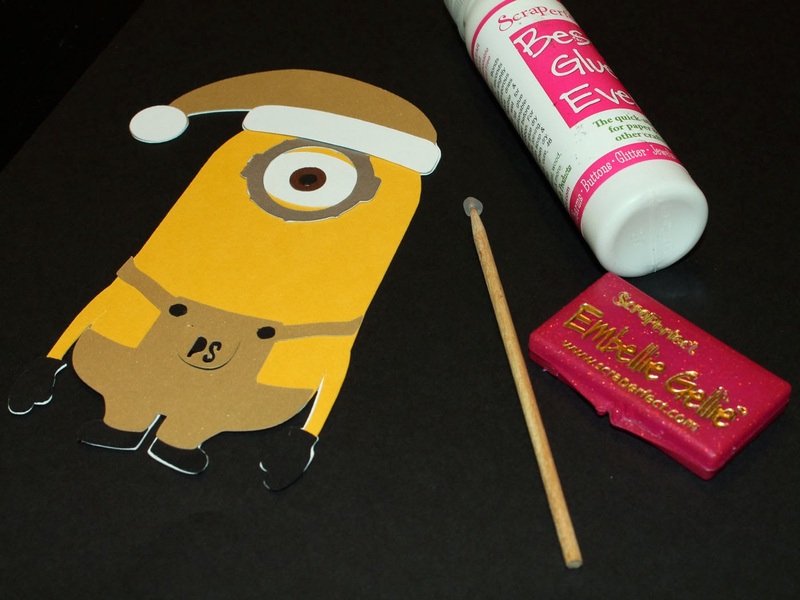 I would like to talk to you about paper piecing with the Best Glue Ever and Embellie Gellie. Two products that make paper piecing a breeze!!! 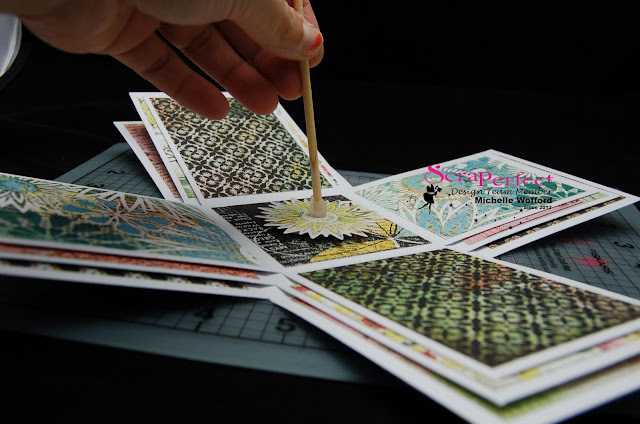 I would like to point out a few tips when paper piecing. 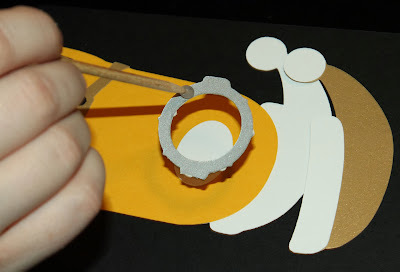 To begin, you only need a SMALL amount of BGE for the paper pieces to adhere to each other. It dries instantly. Something to note is if you lay your glue down right away while it is still white, you have a small amount of "play" before you won't be able to move the piece. If you wait for your glue to go clear; in the tacky stage these pieces WILL stick together instantly. 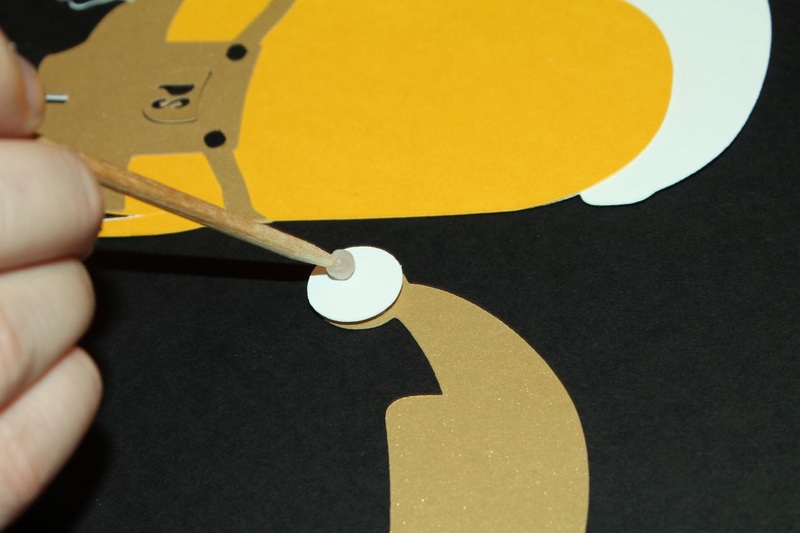 You will not be able to pull it apart or slide the pieces into place. When paper piecing, I recommend to adhere your pieces while the glue is still wet (white) so that you can line it up exactly the way you want it. Regardless if it is a tiny piece or a large piece the amount of glue stays the same. As you see on the yellow, I have only placed a thin line of glue on the outside of my project piece. I haven't put any glue in the middle. This thin layer of BGE WILL adhere the entire piece to the base of my paper piecing ; AMAZING isn't it!!! Now lets talk about the Embellie Gellie - an extremely useful tool when needing to pick up small parts for paper piecing. 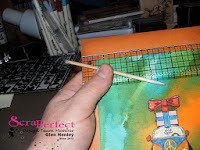 Your fingers stay out of the way and don't become all sticky from trying to place those tiny pieces of paper to your project. Fourth, LARGE pieces such as the hat for the minon. This impressed me the most because I never thought it could pick up and hold a large piece like this. I even twirled the Embellie Gellie around several time and the hat never fell off it. Strong hold but easy release! 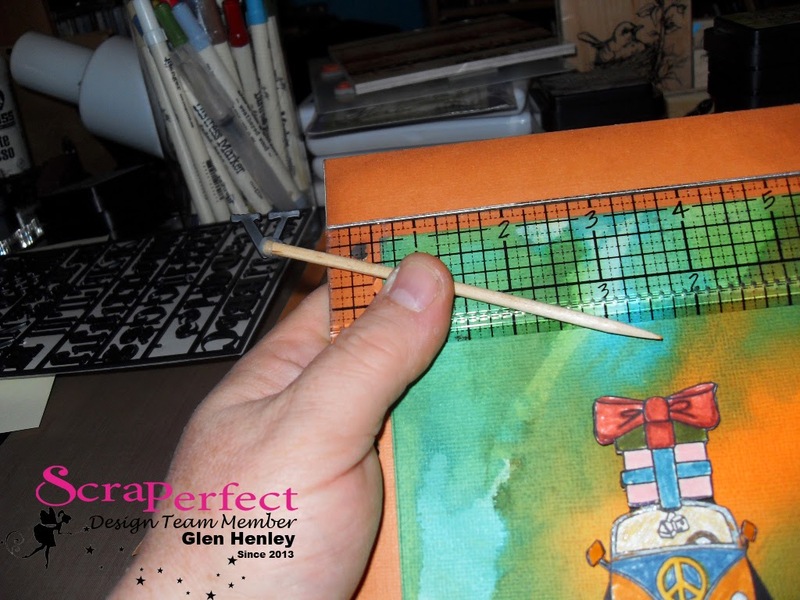 A brief tip that I came across while working with paper piecing is that the opposite end of the Embellie Gellie (flat end) is perfect for pressing down your pieces to ensure FULL contact is made with one another. 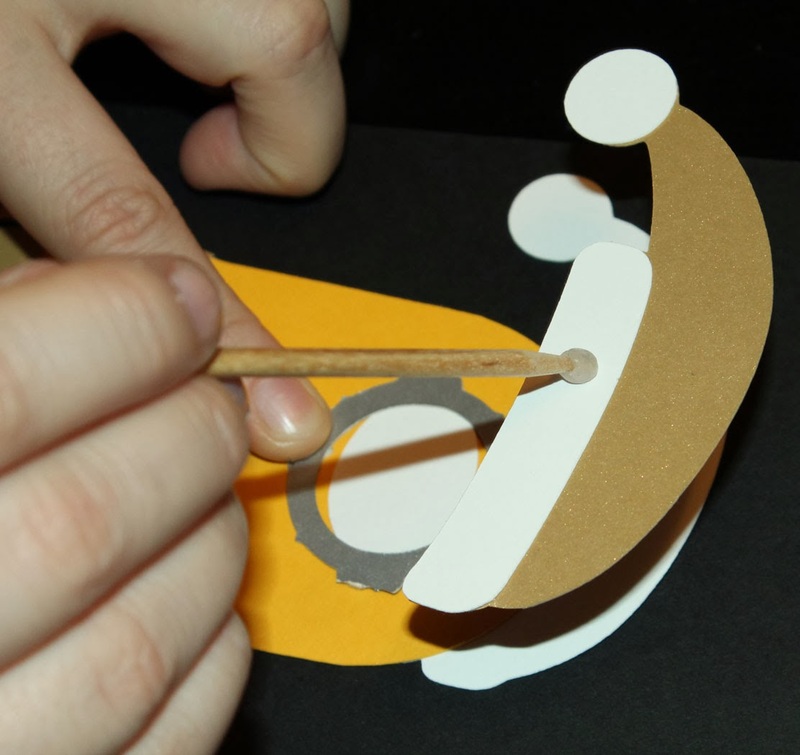 It also allows you to flatten out the pieces that you are placing and building on top of each other. 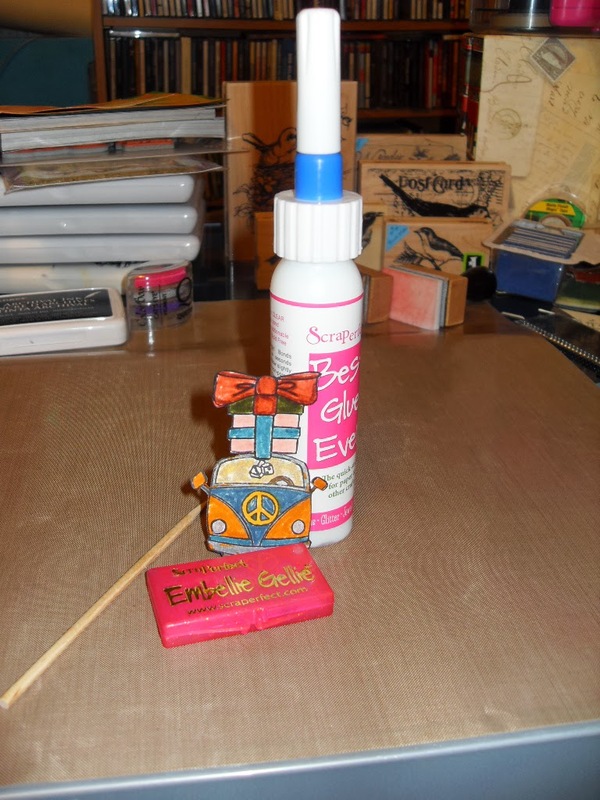 Using both the Best Glue Ever, and the Embellie Gellie made this project simple and quick to put together ; especially when I made 24 of them! 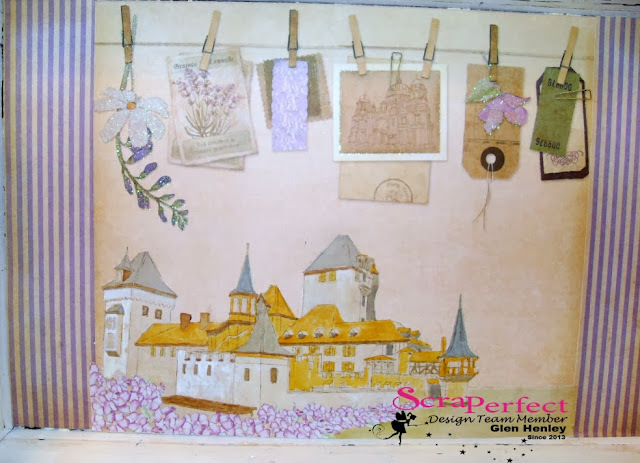 These are some helpful tips on how to paper piece using these 2 products from ScraPerfect. Thansk for stopping by the ScraPerfect blog! 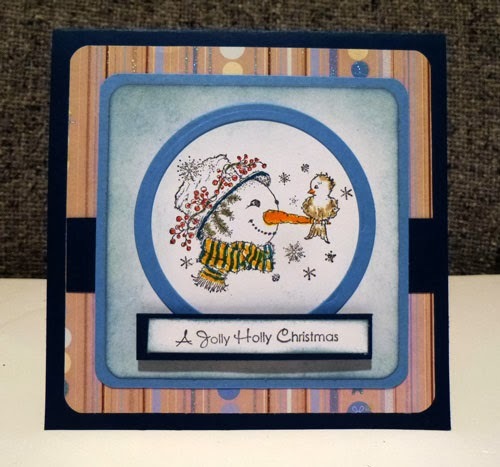 Good morning ScraPerfect friends Steph here today showing you how to make this simple Holly Jolly Christmas card. I'll also show you how The Best Glue Ever was the perfect adhesive to use in creating this card. Using 2 sizes together you can easily create an open design which is what I wanted for this card. 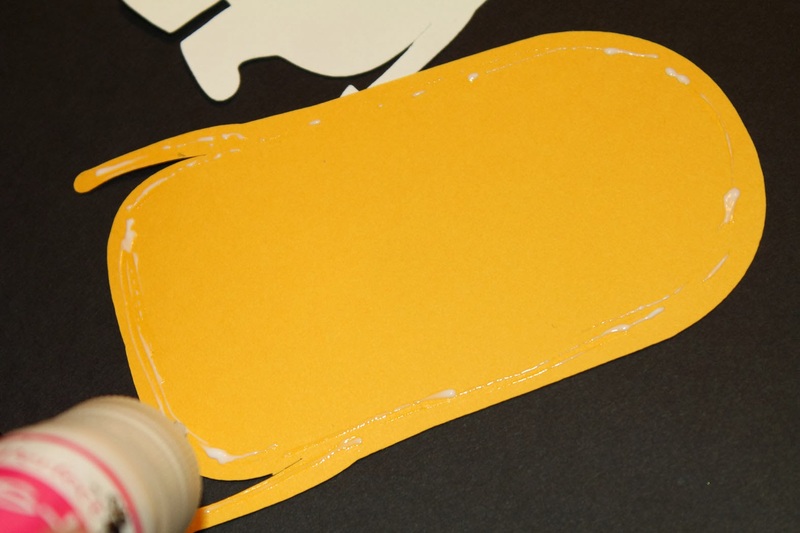 Due to the small area that was to be glued on the card, a tape runner would have left adhesive everywhere. Out came ﻿The Best Glue Ever. Adding several little dots of glue around the circle allowed me to adhere the circle around the snowman with no glue residue. 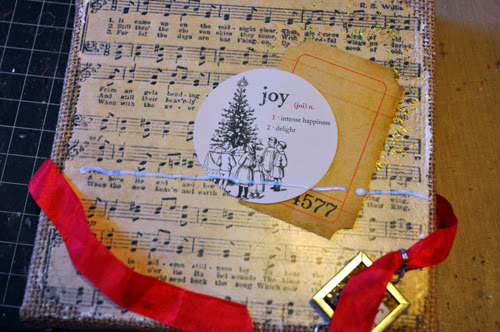 To complete the card, I adhered this panel to blue cardstock, then to the pattern paper. A cute sentiment finished it off. So next time you need to adhere a small area, think of using The Best Glue Ever. 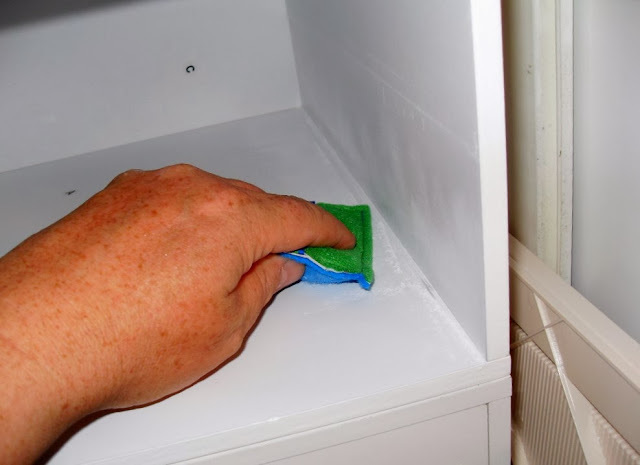 Hey Everyone Glen here again today showing you how to get sticky drawers to operate properly. I found a great use for the Perfect Crafting Pouch I'd like to share with you today. 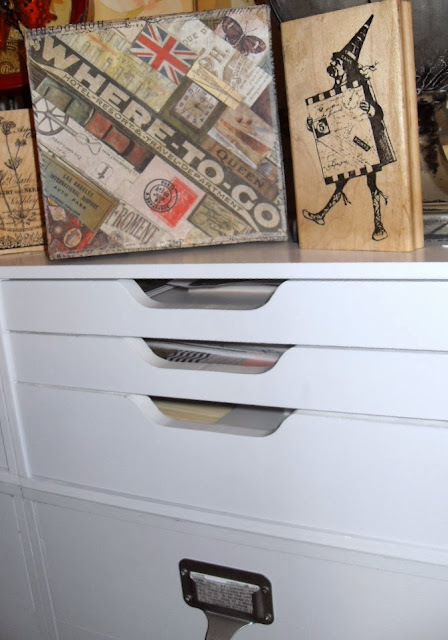 I have a bunch of Recollections cubes that line on wall and at the top of these I have pull out tray drawers. They are three to a cube and always a problem because they stick to each other and it's hard to get then apart. I got out the Perfect Crating Pouch and went to work on the inside of the cube and the contact points on each drawer in turn starting from the bottom and working up. I was very happy to find that they were much easier to get apart now and no more struggling or opening two drawers at once. I love it. ScraPerfect to the rescue again! Try it out. 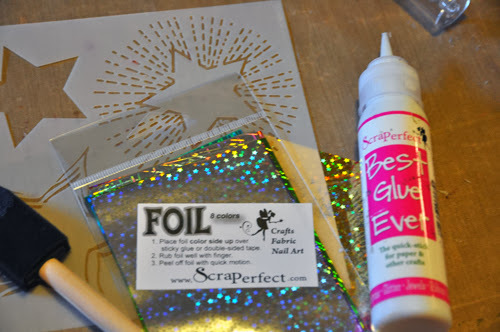 Here's a fun way to embellish your projects - foil and the Best Glue Ever! 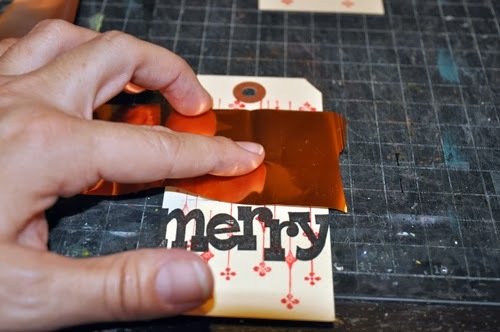 You can use this technique to give a bit of extra shine and sparkle to your holiday projects, cards, and gift tags. 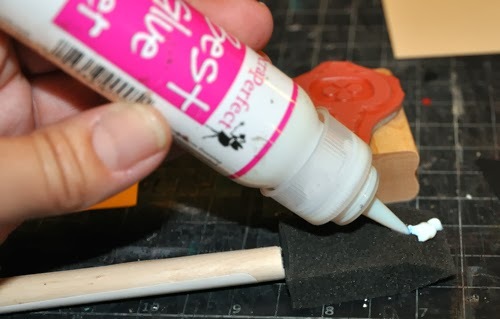 I like to use a foam brush to apply the glue. When Michaels has a 10 for a dollar sale on these I stock up - and I don't care if I use a ten cent brush for one project. I start with a little bit of glue on the end of the brush. 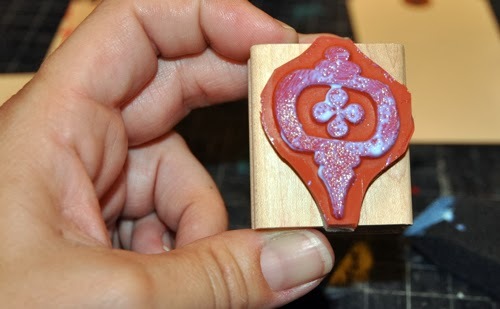 Next, I apply the glue to the stamp. 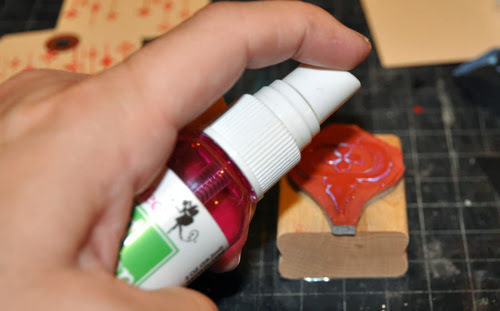 I prefer to use rubber stamps for this technique and I try as best as I can to keep the glue on the surface of the stamp and out of the crevices. You'll notice that the glue isn't perfectly "inked" on the stamp. And that's fine with me, I wasn't going for a crisp image. If so, I would have spread a layer of glue on a scrap piece of plastic and used it like a stamp pad. Apply the glue, stamp onto your project and then go clean the stamp! It's important to clean your stamps right away if you're using anything other than ink. 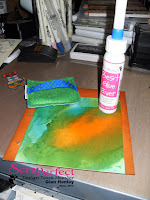 If I have a lot of glue left on the stamp, then I might stamp onto paper towel and wash with soap & water. If the glue has dried at all, I spritz it with the Best Cleaner Ever and wipe with my Perfect Cleaning Cloth. (I have an extra cloth dedicated to cleaning stamps!) Rinse with water. And since the Best Glue Ever dries tacky, you don't have to worry about your project. The glue will be ready when you are. Can you see the stamped area? Finally, I apply the foil -- color side up -- and rub lightly over my stamped image. You can repeat this several times until the entire image is covered. And here's same technique on a card. 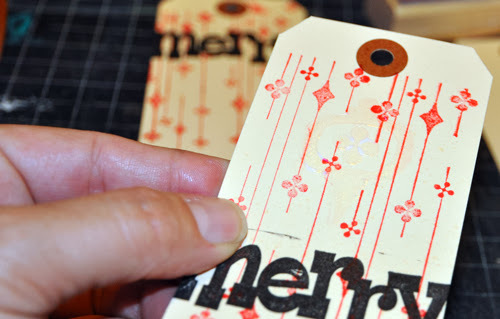 I stamped snowflakes onto a small tag as an accent. It's Glen here and I'd like to share two new projects I'm working on today. 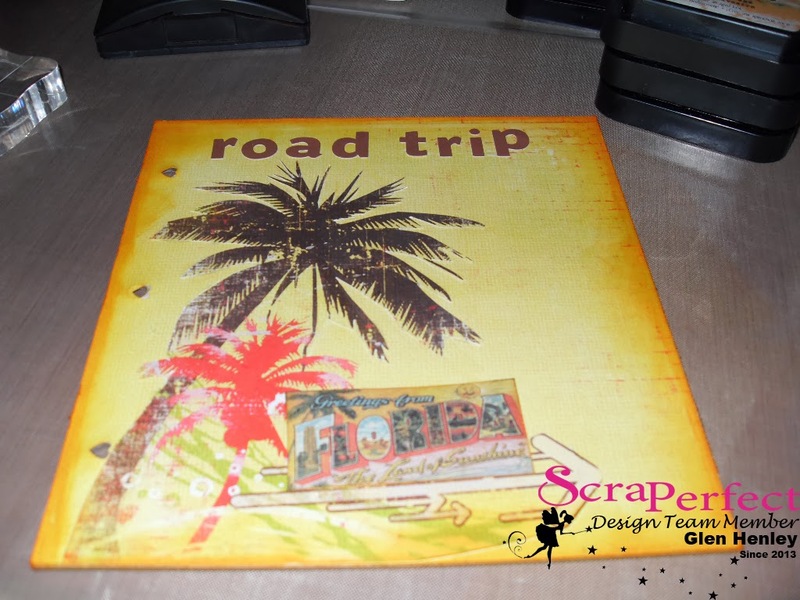 Both are travel albums that I'm making using the products from ScraPerfect. I used the Best Glue Ever to adhere the watercolor paper to the cover of the fist album, then after detail cutting the palm trees used it again to add that to the front cover of the second. It was so easy to work with on the fine points of the palm tree and even where it squeezed out I just wiped it away and it was clean! The coolest thing was when I did the lettering, it used to be a drag for me to place letters and I hated doing the best part of many projects which is the words. But with my trusty Embellie Gellie all I had to do was pick em up and put them down. Gone were the wasted minutes spent painstakingly putting letters on and taking them off again or nudging them in place over and over again! The importance of good tools and materials. So here are the finished covers of my albums, as you can see I added more detail to the both albums using the amazing Best Glue Ever and the versatile Embellie Gellie both are affordable and if your local store doesn't carry it, ask them to order some in! Otherwise, it's available online, so just follow the links and come back soon to see more projects and techniques. Thanks for stopping by and check out the others on the team as well. 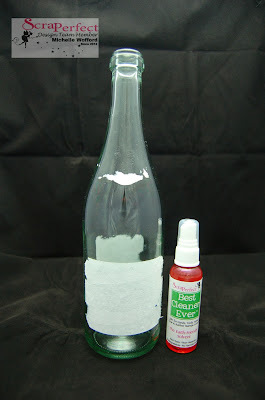 Hello, Michelle here to share with you a simple way to remove a label using the Best Cleaner Ever. I started by peeling the top part of the label off. 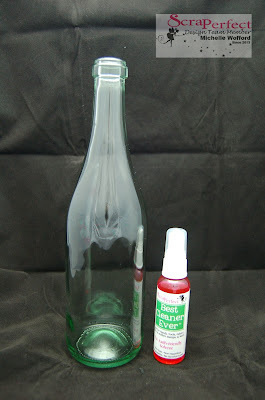 Then spray a generous amount of the Best Cleaner Ever over the areas where the remaining label is. Give a little rub with your fingers and let it sit for 15 minutes or so. Now carefully take a razor blade and gently scrape the label from the bottle. The label comes off clean and easy. Rinse with water and you've got a clean bottle to embellish. 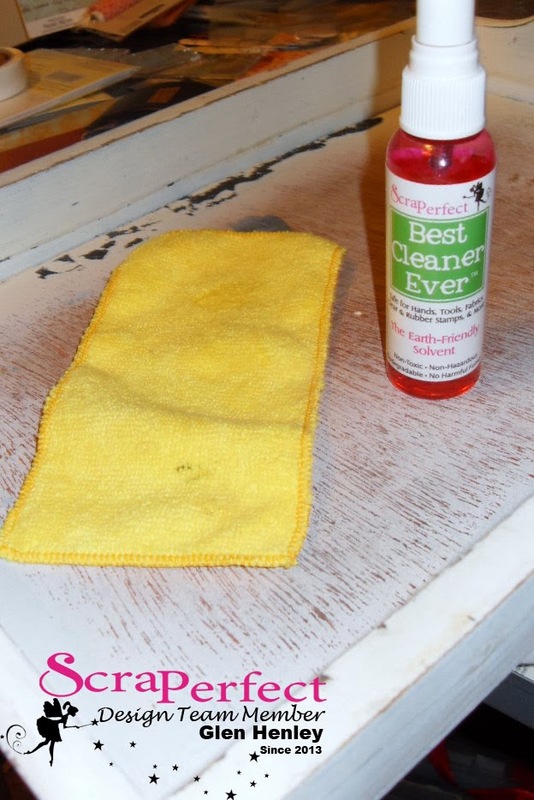 Best Cleaner Ever: A Safety Story!